Is powerful China a threat to the world peace and stability? They [Chinese] don’t think like that. For them, increasing the influence of their civilisation across the world is an objective; they think expanding in their neighbourhood and the rest of the world is their right. They want to be number one in the world. They think it [expanding] natural, while the world takes it as China’s design. We too say that it is China’s expansionist design. Some are overt and some are covert. In all the countries bordering China, especially in the ASEAN region, there are more than 300 Mandarin speaking schools run by Han Chinese. In Mandalay, the second largest city of Myanmar, ethnic Chinese people’s control over gold, cloth and cosmetic markets is overwhelming. This is a cause of concern among local people of Myanmar. In South Asia, they have built seaports in Sri Lanka and Pakistan and then they are in Bangladesh and Nepal. So their design is explicit. How do you see the India-China face-off on Doklam? To understand the Doklam face-off, you have to look at China’s supreme leader Mao Zedong’s ‘right hand palm and five fingers’ strategy. In the 1950s, Mao described Tibet as the right hand palm, while Ladakh, Sikkim, Bhutan, Nepal and Arunachal Pradesh are five fingers. Because the Chinese were not stopped [by the world] when they were occupying Tibet in 1959, they have now got emboldened to move towards five fingers. Had Tibet’s capture [by China] been prevented, incidents like Doklam would not have taken place. For 60 years we were shouting from the rooftops that what happened to Tibet could happen to the world, but no one took us seriously. Now we have before us incidents like South China Sea, East China Sea and Doklam. China is a powerful country with surplus money to dole out assistance and pour investments across the world. Given this, aren’t you taking the bull by the horns by seeking international support for the Tibetan cause? We lost our country because China was then a very powerful nation. The same powerful China is still around us and we are used to it. Despite this, we must find ways to do it [pressurise it to bring to the negotiating table]. At the government level they [Chinese] are under tremendous pressure from the international community members. At the people’s level, there is more interest; people want to know as to what China is doing to Tibet and Tibetans. They ask that, if China wants to become the number one country in the world, then what is it doing to Tibet? Debate and discourse have begun across the world on the Tibetan issue and this is seen by us as a positive development. Your comment on the China-led One Belt One Road (OBOR) initiative? (Laugh) I should tell you that people of our grandparents’ generations used to sing a song in the praise of China’s Communist Party for showering silver coins on the people in Tibet. Silver coins were given to people so that they could help them [China’s Communist Party] build the highway. When the highway was built then, the first to roll out on it were trucks. Soon after this came tanks and it was followed by occupation of Tibet. Therefore, it would not be hard to predict about China’s design behind its OBOR initiative. 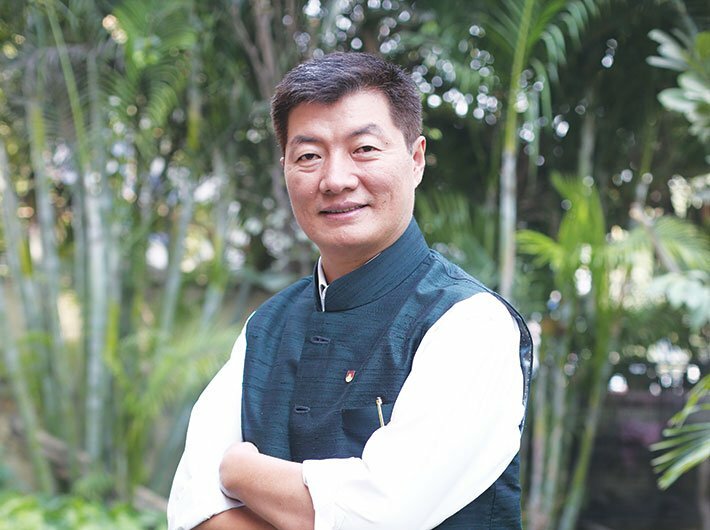 It is said that the Tibetan cause is receiving more fillip under the present government than the previous UPA government. Is it true? All Indian governments have supported us more out of humanitarian than political reasons. All past presidents or prime ministers extended their warmth and respect to the Dalai Lama. But there was a marked difference when president Pranab Mukherjee was in the Rashtrapati Bhawan. On December 10, 2016, the Indian president invited the Dalai Lama to the Rashtrapati Bhawan for a public event. For the first time, what previously used to be close door meetings between the Dalai Lama and Indian leaders became public. In America, when a US president meets the Dalai Lama, American authorities release a picture. They make it public. The same is happening now in New Delhi, which is certainly a good development. Then, during the swearing-in ceremony of Narendra Modi on May 26, 2014, I was seated in the front row with other dignitaries, while the Chinese envoy was sitting in the back row. You can understand it. But I was invited by the BJP. It was a great honour for me and the Tibetans. We pray for the success and happiness of India and Indians. More than half a century has passed since Tibet was occupied by China. Has your non-violent way to advance the interest of Tibet paid off? We feel the Gandhian notion of ‘ahimsa’ is the best way and we will continue to follow that path. Non-violence may take some time, but it is the right approach. Violence is futile. Yet we feel we have to be more active across the world. We will do that in a more forthright manner. This is your second term as the regent of the Tibetan government in exile. Did you get any opportunity to have a dialogue with a representative from the Chinese government? Not yet. The last dialogue between the envoy of the Dalai Lama and the Chinese envoy was in January 2010. Seven years have passed there has been no meeting between the two sides. As there is no interaction between you and China at the official level, how do you manage to get information on developments in Tibet? Buddhists, journalists, businessmen and scholars from China and Tibet keep coming to Dharmashala. They meet us and this way, informal interaction goes on between the two sides. Yet we are not sure [laughs] whether information provided by them is correct. What’s your stand on the Rohingyas? Very sad, very sad. They are human beings and what the Myanmar government is doing is very wrong. We must treat all human beings humanely; with love and affection. We say this as Tibetans who lost their country. Had India not given us shelter or treated us well we would have been in a very bad situation. Similarly, the Rohingyas too deserve a place to stay in. Their plight dents the image of Buddhism. Myanmar is a Buddhist country and it should treat Rohingyas as human beings. Among Indian leaders who are the ones who have made a deep impression on you? All Indian leaders and freedom fighters, from Mahatma Gandhi to Jawaharlal Nehru to Vallabhbhai Patel to Subhas Chandra Bose, are my heroes and, of course, Jhansi ki Rani. I am deeply influenced by their struggle for India’s freedom.